*Prices are per delegate, inclusive of all course materials. Prices do not include accomodation or meals. Above is the diary of public courses currently scheduled. If you would particularly like to attend a public presentation of one of the other available courses, please contact Penny directly. 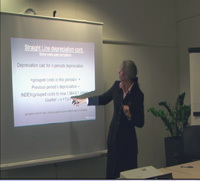 Alternatively, if your organisation has three or more delegates for a course, it may be economic to arrange an in-house presentation just for your staff. For further information or to make a booking please contact Penny, noting the course(s) you are interested in and any other relevant information, and she will respond as soon as possible.